Frequency-resolved optical gating (FROG) is a technique that produces a spectrogram of an ultrashort laser pulse. The intensity and phase of the ultrashort laser pulse can be determined through solving for the phase of the spectrogram with an iterative, phase-retrieval algorithm. This work presents a new phase-retrieval algorithm that retrieves both the probe and the gate pulses independently by converting the FROG phase-retrieval problem to an eigenvector problem. The new algorithm is robust and general. It is tested theoretically by use of synthetic data sets and experimentally by use of single-shot, polarization-gate FROG. 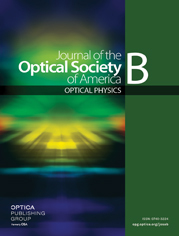 We independently and simultaneously characterize the electric field amplitude and phase of a pulse (probe) that was passed though 200 mm of BK7 glass and the amplitude of an unchanged pulse (gate) from an amplified Ti:sapphire laser. When the effect of the 200 mm of BK7 glass was removed mathematically from the probe, there was good agreement between the measured gate and the calculated, prechirped probe.